Smart eating places serve scrambled eggs with smoked salmon for breakfast or a light lunch, so I thought why not go along with that with a Solent version? It works best with highly smoked and well seasoned mackerel, so it is woody flavoured and not too limp and fishy. This may be a bit much to take first thing in the morning but for a Sunday brunch it is very good. This is too easy. Toast your bread, meanwhile make scrambled eggs. (if you are new to this – melt butter in a pan. Beat eggs, a splash of milk and a pinch of salt and pepper in a bowl. Pour the mix into the pan, and stir very gently with a flat spatula to move the set egg off the bottom of the pan to make room for the runny stuff. In a minute or two it will be looking scrambled. While it is still a bit runny, take it off the heat – it will carry on cooking by itself and you want it sloppy, not set rock hard). 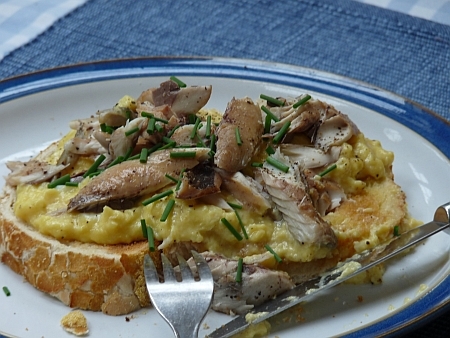 Butter your toasted toast, top with the eggs, and pile flaked, boned, de-skinned mackerel on top. Sprinkle with herbs and voila, your brunch.